Anyone with any brain has known that it's been over inflated since Trumpty Dump took the helm with his shakey fists. You do know it's up almost 6,000 points since Trump took office, right? Only the beginning, OK buddy go back to your alternate reality. 28% increase in one year. Jeez, someone fell asleep during high school economics class. Anyone with half a brain knows a sell-off comes after after an incline in increases. Most of investors wondered why it took so long for all those institutional investors to cash in and make a profit. Maybe because they were waiting for the rising interest rates shoe to drop, which pretty much didn't look like it was happening until now. Free advice: don't panic and bolt. Wait it out and if you have the $$ buy more stocks on this downside. When you see it increase over the next year you'll learn another lesson you slept through in class - dollar-cost averaging. The older I get the more nervous I become about our stocks. The stock market has always been up and down. We have had a huge increase since Trump became president so even if it goes down we are still up because of the huge jump in the stock market. My funds are doing good. As our economy continues to grow so will our 401K's thanks to our president. Obama must be one smart cookie. He must have planned for the stock market to take off the day he left office. It is amazing those delusional Oh ha ha supporters can feed themselves. It was way overdue for a correction. You only lose money if you panic and sell. Why you celebrate America loss. That evil way. if you didn't know a correction was coming then you need to take your head out of the sand!! Better yet, stay away from the stock market. Yeah, it?s correcting the hysteresis lag from the 2016 election. I called this a year ago. The gains were obama policies. Do not confuse the pubies with facts, fuzzy. Following Friday?s massive market selloff, the biggest points decline for U.S. stocks since the financial crisis, analysts and fund managers are laying out a laundry list of things that could derail the now almost nine-year-old bull run. The selloff introduced a new degree of fear into the market, analysts say. The biggest worry for investors seems to be government policy, both from the fiscal and monetary side. ?Was it a good idea to hit the accelerator when the economy was already at the speed limit?? The other major worry, though, appears to be over the tax reform bill passed earlier this year by Congress and signed by President Donald Trump. Economists and money managers fear that the increase to the $20 trillion U.S. national debt could carry major blowback to markets. ?The issue is, did tax reform kill the bull market or is tax reform a fiscal policy mistake? That?s what the market is struggling with,? said Nicholas Colas, co-founder at DataTrek Research, in a phone interview. Yawn............ When it starts it's incline again. The libtards are going to start saying it's because of Obama. Not quite a correct which has to be down at least 10% by definition, but almost. Nothing substantive to say to Joe and Fuzz's point? The economy was growing just as well under Obama. It's true the market was growing under Obama- since Trump took office, it's been going up at an unrealistic pace- anyone who's had stock for a long time expected a correction to take place- just don't sell- people who are day traders will get slammed, but you should plan to be in for the long haul- if you want to gamble, go to Vegas. The economy was growing just as well under Obama. It's taken off under Trump. Up 567.02 today. You liberals live in fantasy land. Nothing from "The Short Bus Gang yet..."
They haven't gotten their talking points yet. Crash and burn on Trump Dung-Un's watch. Wow look at that market roar... downwards. Wow look at that market roar... downwards.? So you are happy people are losing money? But people aren't right? I mean massive tax cuts for the middle class and all...and fuzz didn't say anything about being happy. That's confirmation bias on your part. So you are happy people are losing money?? He didn't say that. Comprehension problem, OrdinaryFool? How much did it go up under obama? What was the Dow Jones Average When Obama became President? 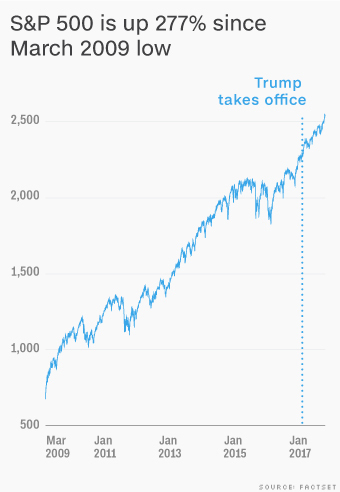 When President Obama took office on Jan. 20, 2009, the Dow Jones Industrial Average slumped to 7,949.09, the lowest inaugural performance for the Dow since its creation.